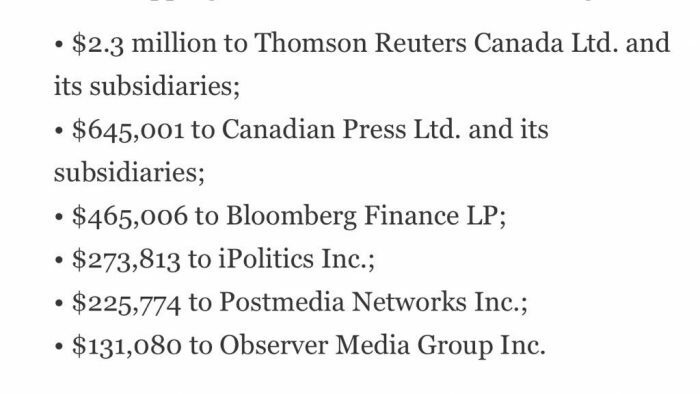 I am told that Public Accounts show the government annually shovelled thousands at iPolitics for most of the past decade – more, even, than all of Postmedia got. Neither The Tyee nor Blacklock’s nor The Hill Times (where, coincidentally, I’m a long-time columnist, and where, coincidentally, the “affidavits” column first appeared) receive buckets of government boodle. Most of iPolitics’s coverage of the sexual misconduct story has been CP wire copy. As they say: just saying’.